The drill continued on its third hour of digging through the deep Indian stones while more and more people's faces began to turn from expressions of excitement to disappointment. I began preparing myself for the worst. "What if we don’t hit an aquifer?" "What if we made the wrong decision to drill here?" I couldn’t take the anticipation and decided to walk down the dirt road to feed some of the wandering goat herd while the large, loud rig continued to carry out its task. After sharing my Clif Bar with one of the baby goats, and after dwelling on my thoughts of how I would begin another fundraising campaign, my sweet friend and pastor of the startup church in the village came running around the corner screaming in his local language. "Sister Jaya, Sister Jaya. We get 3 inches power. So much water. Abundant. Come now!" Although he only stands about 4 feet 9 inches tall, his gate was powerful and voice more confident than I'd ever heard before. Rightfully so - we had finally hit water! As an abundance of life's most precious resource began spewing up and out of this once "dry" land, I breathed out a deep sigh of relief. 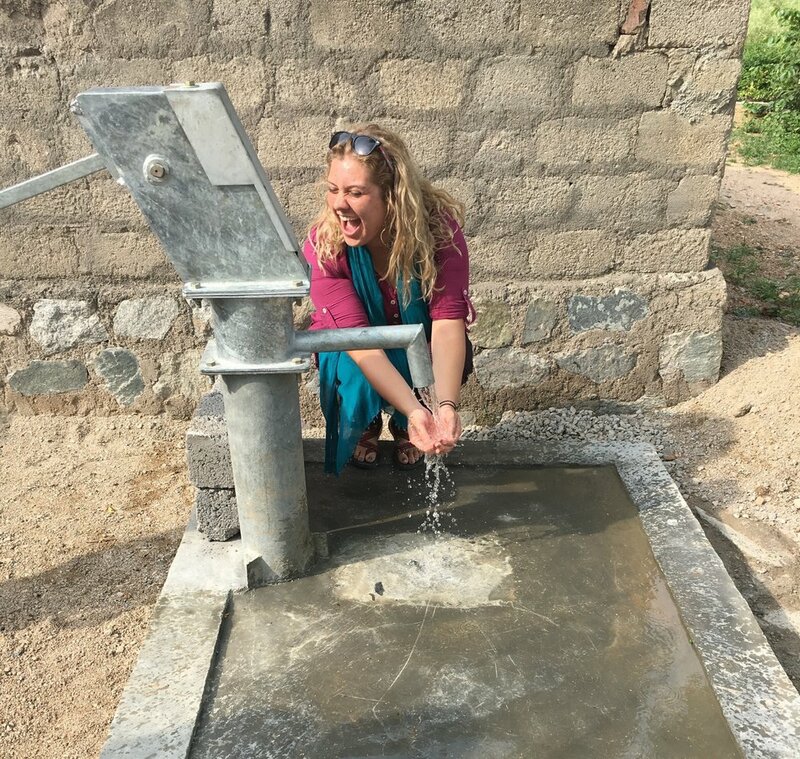 I took a moment to remember five years prior when I first made a decision to follow God's call in dedicating my life towards helping end the world's water crisis. Memories of being a 19-year-old student at North Caroline State University, eager, excited and, in all honesty, a tad naïve flashed through my mind. Tears began to flow and I couldn’t stop thinking how blessed I was to be in that village in this moment, witnessing this water miracle for myself. My village friends would no longer have to walk three kilometers every day to cook and clean and sustain their families. They could teach, they could bathe, they could send their kids to school, they could hold baptisms and not worry about having enough water for when their kids come home from an afternoon of rolling tires and chasing chickens outside. As a 25-year-old American traveler, I've had the opportunity to see quite a few humanitarian projects implemented around the world. Partnering in these projects, I've come to realize that there is no better feeling than realizing you've stood next to Jesus and loved on his kids with him. Galatians 6:2 says, "Carry each other’s burdens, and in this way you will fulfill the law of Christ." My heart's desire is to continue to do what this verse says, and walk with the Holy Spirit wherever he wants to go next in fulfilling this goal. This is my motivation in going to live in the Dominican Republic to serve with Wine To Water. Not because there are filters to be handed out, although there are indeed. Not because there are projects to do - there are plenty of those too. But because my father God is doing work in the Dominican Republic right now, restoring dry land to a land of abundant life, and I absolutely have to be a part of it. My love for my savior compels me to do so. My intimacy with him keeps me close by his side. Where he goes, I go. Thanks for following in this journey with me. I'm so looking forward to this year and hope to see some of you soon serving alongside us in Moca, DR in 2018!